Their response to the system was highly encouraging and embracing, but they were just as vocal in correcting some of the assumptions we had made during system development, as well as pointing out ways in which we can improve SELV in its next iteration. We have produced two rounds of monthly reports from the system since the launch, giving me time to reflect on the journey this project has taken over the course of the last eight months. 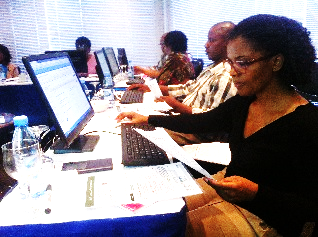 MOH Monitoring and Evaluation Officer learns how to use SELV to consolidate data for decision-making. Quality data, when collected and reviewed in a timely fashion, provides a great deal of insight into current status-quo and the process management needed to make improvements. Thus, strengthening the information flow not only improves logistics cycles and supply chains, but also makes the overall health system stronger by improving information systems and empowering decision-making capacity at all levels. Through our work in this field, VillageReach tries to address this very issue of timely data collection, data visibility, and most importantly, data utilization. In Mozambique, we have embraced the philosophy that “The Last Mile of Delivery is the First Mile of Information”. As part of the Dedicated Logistics System (DLS) Program, government officials (field coordinators) make a monthly vaccine distribution run in each province lasting two weeks. 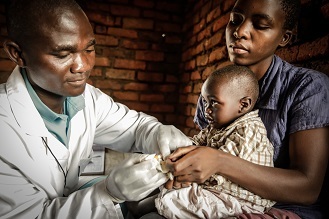 They collect paper-based supply chain and health service delivery data from each health center they visit, which they later upload to SELV upon completion of a distribution run. In addition to full implementation in four provinces (serving some 370 health facilities and a population of 8 million), SELV has also been deployed in a direct-to-digital trial with tablet devices. In this trial, field coordinators in Gaza province enter facility data directly into SELV using a tablet device, rather than collecting data on paper records and then later entering the data into SELV at an office workstation. That’s the data collection aspect. What does that mean for data review and usage? A lot of our time is spent researching global standards for metrics and indicators, and grappling with finding an acceptable medium since the reality on the ground quite often differs from global expectations/assumptions. Hours spent on calculation validation and reporting requirements have led to formulating key performance metrics such as: vaccine stock-out rates; cold chain performance and excursions at health facilities; vaccine delivery intervals to a health facility; wastage rates; vaccine consumption and coverage rates at health facilities and through mobile outreach. The offline, non-SELV based reporting platform we use presents all of this data in the form of graphical visuals tailored to user interaction: the data can filtered down to a specific health center or rolled-up for a province-wide view, depending on the needs of the user. The data information chain can thus go both up and down the system, with these performance metrics used by government staff for planning and executing monthly vaccine distributions runs. The vociferous engagement and participative nature of the individuals involved in the training stood out to me during the week I spent in Maputo. It gave me a great deal of comfort in knowing that the rich data coming out of SELV had people eager to use it while ensuring that we, VillageReach and its global partners, also understood the data in the context of realities within Mozambique and not just as stand-alone numbers on paper. Thus, the journey I referred to at the start of this piece isn’t over yet and nor has any complacency set in — our work is entirely iterative and we challenge ourselves by asking difficult questions such as: “how do we help government decision-makers deal with inconsistent data coming from different sources?”; “how do we resolve the inconsistent data we ourselves might be helping produce?”; “how do we ensure that health workers are not being subjected to data collection burden, especially if they feel that there is no feedback loop telling them what the point of all this collection is?” and so on. Vidya Sampath works on the design and oversight of impact and process evaluations of various HSG programs, while providing technical and management assistance to day-to-day project implementation and advocacy work. Vidya has over five years of international development experience in South Asia and East Africa, carrying out project start-up efforts, implementation, M&E, trainings, capacity-building, and community-based and lead participatory research. Prior to joining VillageReach, Vidya worked with Plan International, the Russell Sage Foundation, and the World Health Organization. Vidya holds an MSPH in International Health Systems from the Johns Hopkins Bloomberg School of Public Health, and a BA in International Relations from Mount Holyoke College.